Breaking News: Jane Yagoda of A Gardeners Kitchen will be at the Montclair Farmers Market Saturday March 26 from 9am to 1pm. Possible other inspirations, but right now this on the board for sure. The Winter Montclair Farmers’ Market is every Saturday from 9 – 1 at the Walnut St Train Station. It is smaller than the popular Summer market but still includes favorites like Picklelicious, Jams by Kim, and Stefan’s. Rumor has it that Matarazzo Farms will be bringing Spring flowers to market just in time for Easter. Jane impressed everyone at Taste of Montclair earlier this month with her famous Tomato Soup. 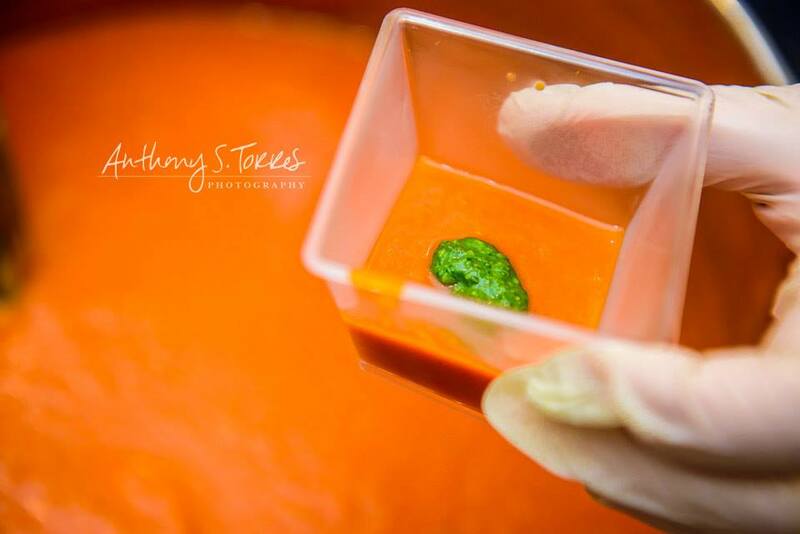 Photographer Anthony Torres‘ photo of the soup has been posted and shared on social media more times that we can count. Tomato-Fennel soup with Kale Pesto Tomato Soup will be available in limited quantities on Saturday so get there early! Be sure to like A Gardener’s Kitchen on Facebook, follow on Twitter and Instagram. A Gardener’s Kitchen connects my love for delicious healthy food, beautiful photography and the serenity of the garden. Like many chefs, my appreciation for great tasting food started at an early age. One of my first food memories takes place in my childhood backyard in Miami, wearing a favorite sundress and savoring sour cream and bananas. I was introduced to the food business in my teens when my parents bought a Kentucky Fried Chicken franchise. Working at the store, I welcomed the frenzied lifestyle and the rewards, which for me was watching one set of kitchen hands gently flour chicken while another lifted whistling steam pots of bubbling golden chicken. The cooks shared their tiny shots of Cuban coffee, secrets to creamy flan and how to blanch fries for ultimate crispiness. It didn’t take long to figure out the camaraderie in the kitchen was as important as the meal it produced. Florida led to photography studies in Santa Barbara, California where I discovered farmers markets and embraced local food like a new best friend. Returning to the East Coast my desire to explore the culinary arts and zest for adventure, landed me in Paris. While attending Ecole de Cuisine La Varenne I ate, cooked and experienced a lifestyle that touched all five senses. Paris became a brownstone in Brooklyn with two lovely sons and a sunny garden. My travels and experiences evolved into professional work as a food editor, recipe developer, food stylist, marketing associate and personal chef. As founder of A Gardener’s Kitchen granola, Jane is involved with its day to day operation and production. Her personal cooking services are available in the NJ/NY metropolitan areas. Contact Jane for additional information.